← Coaching session attended horses exclusively for people with fibromyalgia. 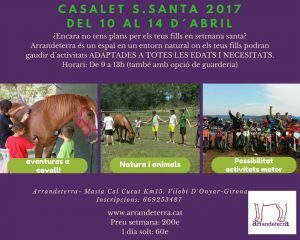 If you have plans for your children, work Arrandeterra its doors once again to Casalet Easter from 10 to 14 and april. Your children can enjoy nature, animals and activities suitable for any age and necessity. Our multi-discipinar, monitors, coaches, therapists will be happy rebrel's.